Open Front displays feature slanted back shelves to allow a full view of literature while keeping literature neat and organized. Constructed of solid oak sides with oak veneer backs. Removable dividers keep literature and magazines orderly. Accommodates 4" brochures or 8-1/2" x 11" and wider literature. Hardware for wall mounting is included. Displays can be wall-mounted, or used as a floor display with use of the Y2293 legs below (sold separately). 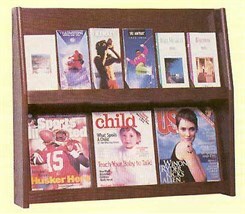 16 Pamphlet/8 Magazine Display measures 19-1/2"W x 4-3/4"D x 49"H overall. Order other sizes below. Shelves measure 18"W x 11-1/2"H x 1-1/4"D. Shpg. wt. 30 lbs. PRICE INCLUDES SHIPPING! Please allow 1-2 weeks for delivery. 24 Pamphlet/12 Magazine Display features slanted back shelves to allow a full view of literature while keeping literature neat and organized. Constructed of solid oak sides with oak veneer backs. 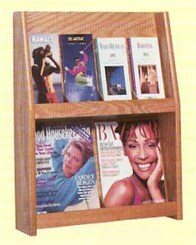 Removable dividers keep literature and magazines orderly. Accommodates 4" brochures or 8-1/2" x 11" and wider literature. Hardware for wall mounting is included. Displays can be wall-mounted, or used as a floor display with use of the Y2293 legs below. Measures 28-1/2"W x 4-3/4"D x 49"H overall. Shelves measure 26-3/4"W x 11-1/2"H x 1-1/4"D. Shpg. wt. 37 lbs. PRICE INCLUDES SHIPPING! 12 Pamphlet/4 Magazine Display features slanted back shelves to allow a full view of literature while keeping literature neat and organized. Constructed of solid oak sides with oak veneer backs. Removable dividers keep literature and magazines orderly. Accommodates 4" brochures or 8-1/2" x 11" and wider literature. Hardware for wall mounting is included. 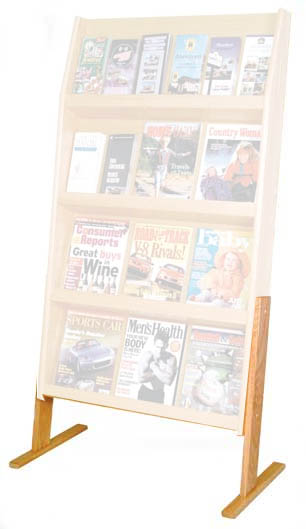 Displays can be wall-mounted, or used as a floor display with use of the Y2293 legs below. Measures 15"W x 4-3/4"D x 49"H overall. Shelves measure 13-1/2"W x 11-1/2"H x 1-1/4"D. Shpg. wt. 26 lbs. PRICE INCLUDES SHIPPING! 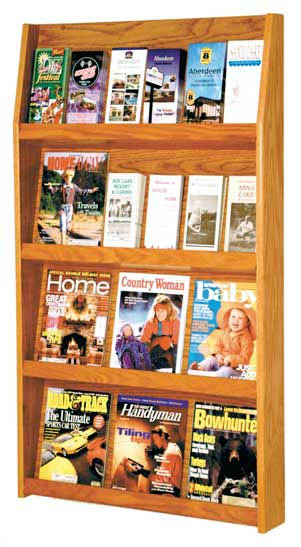 8 Pamphlet/4 Magazine Display features slanted back shelves to allow a full view of literature while keeping literature neat and organized. Constructed of solid oak sides with oak veneer backs. Removable dividers keep literature and magazines orderly. Accommodates 4" brochures or 8-1/2" x 11" and wider literature. Hardware for wall mounting is included. Displays can be wall-mounted, or used as a floor display with use of the Y2293 legs below. Measures 10-1/2"W x 4-3/4"D x 49"H overall. Shelves measure 9"W x 11-1/2"H x 1-1/4"D. Shpg. wt. 30 lbs. PRICE INCLUDES SHIPPING! Converts any open shelf display into a floor display with this leg set. Shpg. wt. 10 lbs. PRICE INCLUDES SHIPPING! Overall 19-1/2"W x 4-3/4"D x 24-1/2"H. Shpg. wt. 18 lbs. PRICE INCLUDES FREIGHT! Overall 28-1/2"W x 4-3/4"D x 24-1/2"H. Shpg. wt. 30 lbs. PRICE INCLUDES FREIGHT!